WWWOOO-EEE!!! Jaw-dropping, eye-popping, fist-pounding permeate every single panel and page!!! 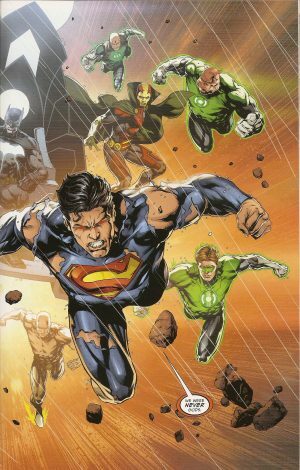 By now, the entire populace has probably read REBIRTH as well as this ish. Well, big surprise (or not): follow along since this leads up to DC’s clean-up of continuity. Diana is an expert general leading her soldiers into the good fight. Her observations make her assess every angle and issue orders to retaliate. 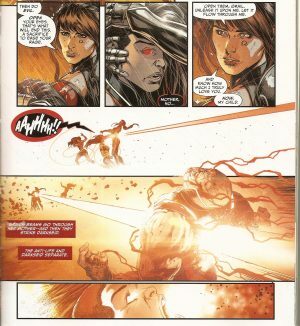 She can easily put her heart on hold but that proves to be a bit more challenging when the transformed Steve Trevor leaps at her. Grail is the ultimate wild child. Her sporadic movements make her difficult to catch and unpredictable. She attempts to seize control of the Mobius Chair but to no avail. Batman knows that her lust for power is ever increasing. Mr. Miracle manages to chain her. The GLC lock her in a cage. She breaks out with the least amount of effort. There’s more than hope for Steve. The fact that he is able to resist the ultimate might of the Anti-Life Equation works in his favour. He begs Diana to put him out of his misery. Permanently. Luthor is more than happy to oblige but Superman manages to block his parry. To remain a member of the JL, the no-kill policy must be strictly followed. 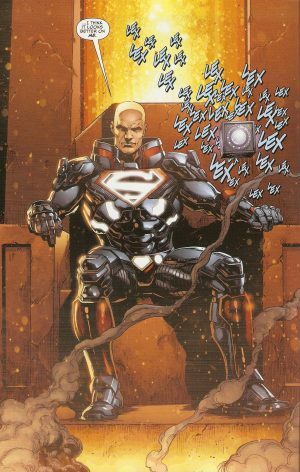 Luthor will unleash the Omega Effect. He rubs it into his forever frenemy that he’ll be Earth’s saviour once more. Superwoman can’t help but gloat. Her bouncing bundle of despair has a different papa altogether. It was never Ultraman nor Owlman who infiltrated her loins. 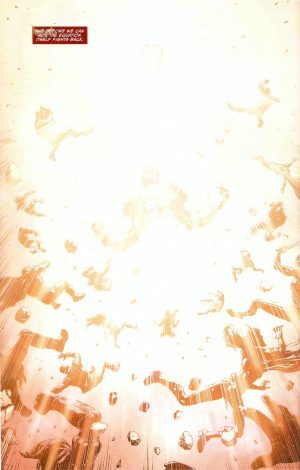 As she screams the word Mazahs (Shazam backwards in case you didn’t know), power is robbed from Lex. Extremely ironic considering that baby boy is the product of Earth-3’s Alexander Luthor. 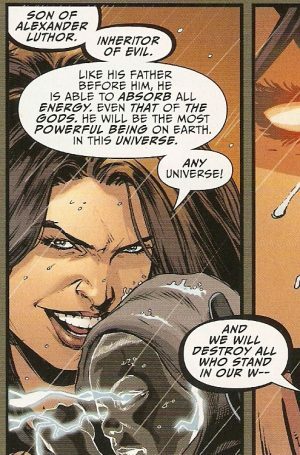 Superwoman’s boasting leads to instant incineration. Grail has cut her off completely and absconds with the newborn. Grail utters the same magical word. Flash is finally free of the Black Racer. Yeah, about that…The Racer must carry out his prime directive: take a life. 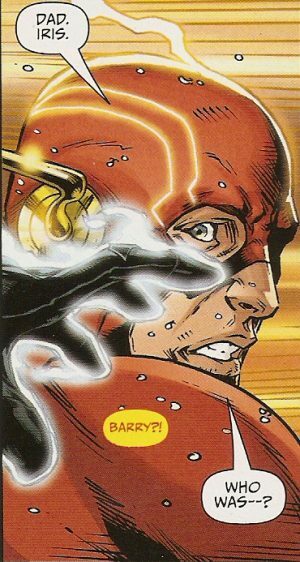 Barry’s super-speed is barely enough. The modern gods start to drop like flies. Shazam himself loses the extra imbued ability housed within him. Victor and Jessica are hapless bystanders in the Green Realm of the Power Ring. She begs him to find a way to bring her back to the real world. As he’s done some times before, Cyborg uplinks to the Ring’s supernatural technology but the binary code has become tertiary. The best way to describe the new variable is fear. Jessica is determined to overcome Volthoom’s hold on her and help her teammates. 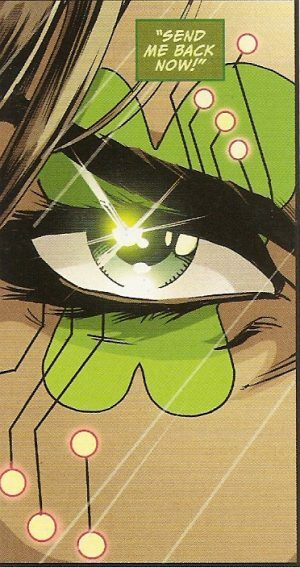 Vic successfully gives her a one-second window to shake off Volthoom’s presence and to help Barry. Jessica materializes in front of the Racer. She takes the fall for her crimson-clad comrade. The Racer is satisfied with the outcome. He disappears to seek others on the verge of death. Lex is outraged that he’s powerless and mocks Jessica’s helplessness and faux status as an emerald gladiator. Superman asks him to muzzle it and to respect the deceased. Wonder Woman’s resolves is hardened more than usual. The vow to end it all has Grail mocking her. She now names herself the Godkiller. The eradication of the League is next on her list. Superman corrects her. They never held those lofty aspirations nor designations. Mr. Miracle asks Batman to access the Chair for a solution. He learns that Grail has misinterpreted the prophecy. Steve Trevor was not the First Man to set foot on Paradise Island. Hence his ability to fight off the Anti-Life Force. Information overload. Batman is suffering a seizure of sorts as the Chair pings uncontrollably. Grail uses the child to de-power Steve. The next scene is completely out of left field – the infant has morphed into the namesake of this war!!! 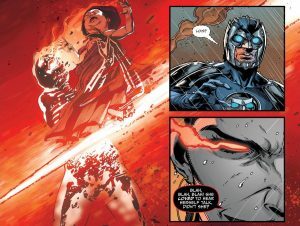 Darkseid makes his grand entrance!! He is but an empty shell, an automaton easily controlled. 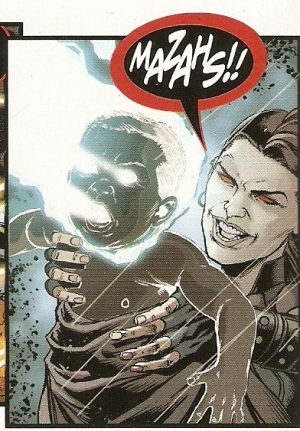 Grail invoked a complex Amazon ritual and combined three different sources: the pilfered powers of the ‘new’ gods, the Anti-Life Equation and baby’s essence. Batman is in agony. He tries to further enter the Chair’s fountain of knowledge. 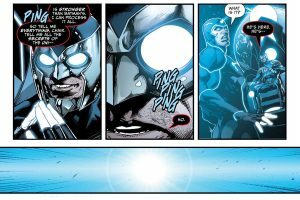 Hal rushes to give him a hand, rather his ring. Willpower has always been its source and Batman has always had more than plenty. Upon contact, an emerald explosion jettisons Batman and has Hal return to normal. The heavens roar. 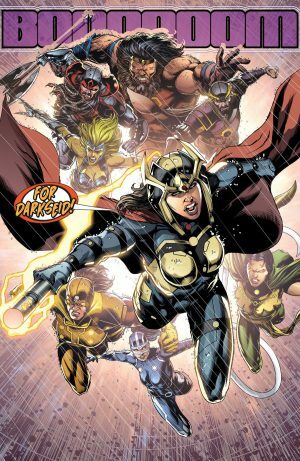 Barda returns in one piece along with her former group The Furies. Kalibak, Mantis, and Steppenwolf are also in tow. They will not stand for their dark lord’s desecration. Bat-Lantern is about to state the solution when Owlman takes possession of the Chair. Myrina tries to reach through her daughter. The wanton destruction and needless killing is the complete opposite of the Amazon code. Myrina lost her way and wants to Grail to see that as well. 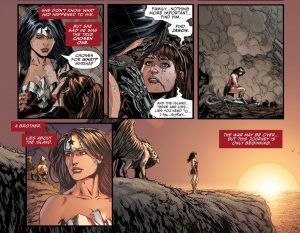 With Wonder Woman’s lasso, Grail is able to resist her evil urges and accept a minute part of goodness within herself. There’s another part to this: only Grail can reverse the effects of the Anti-Life Equation from controlling every single person on the planet as well as the granite-skinned despot. To give her daughter a little push, Myrina states that Grail must fire her Omega beams through her. A sacrifice will quell her daughter’s rage. The deed is done. Everything is reset. 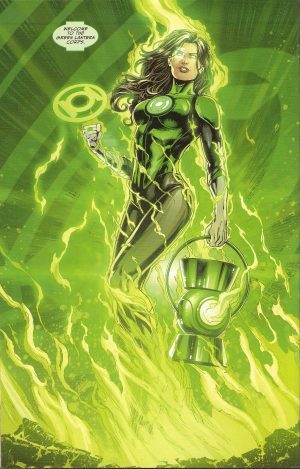 One of the power rings reanimates Jessica Cruz. 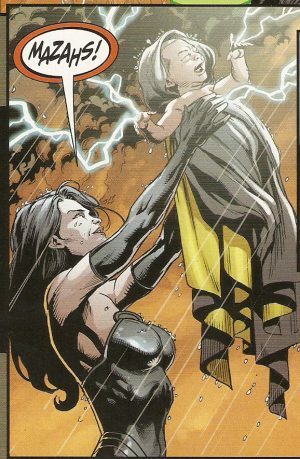 Technically, she was not recently departed since Volthoom resided within her. Introducing the newest and greatest member of the GLC!! The light burns forever brighter and greener. Scot is elated to be reunited with his love. Barda commands him not to display any affection towards her. She has made a pact with the denizens of Apokalips. She has made a difficult choice: for their aid in the war and to keep her husband alive, she rejoins her group. 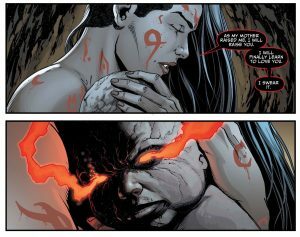 Grail dotes over her ‘child’: it is Darkseid re-born. Literally!! She promises to love and cherish him all the while content in the knowledge of Diana’s biggest secret. The Apokaliptan energy has wreaked havoc with Superman’s physiology. Dr. Silas Stone confirms that the Man of Steel will not be much longer for this world. Lex returns to the only place where he feels comfort and joy: Apokolips. The citizens welcome their new emperor. Baldie is now sporting a new suit of armor with an emblazoned ‘S’ shield. Outrage!! Hal checks up on Bruce in the Batcave. An image of the Joker appears on the screen. Hal wants to know more about him. His curiosity is burning inside him. Who is this maniacal menace? 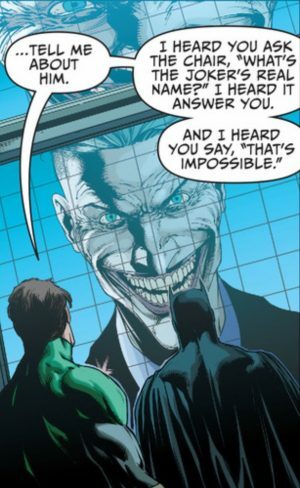 Thanks to the Mobius Chair, Batman gets the biggest about-face: there are three Jokers!!! This goes beyond all probability and knocks him down a notch as the world’s greatest detective. Wonder Woman’s world is also turned upside down. Myrina reveals the shocker of all shockers: the night Grail was born so was Diana as well as…a boy!! Diana has a twin brother. Jason is his name. He is officially the very first man to tread on Themyscira!!! Diana’s entire life has been one soul-crushing lie. Owlman sits smugly on the Chair. Metron expresses his gratitude for his liberation. He warns the Dark Knight dopplegänger to proceed with caution. Owlman brushes off his concern, confident that his mind is stronger than Batman’s. When he requests all the secrets of the universe, the chair responds accordingly. The process is interrupted by an invisible intruder. There is a blue bolt. The Chair is empty. 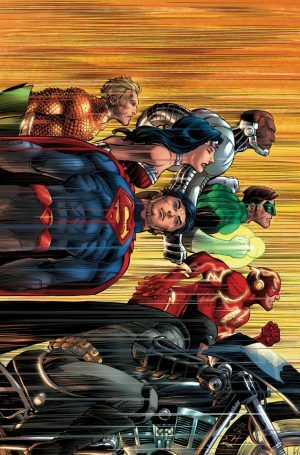 Seven suspenseful words: “To be continued in DC UNIVERSE REBIRTH ”. NNNNNOOOOO!!!!! 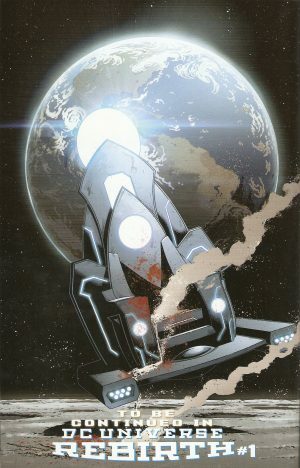 Smartly, I read this book before the much-anticipated release of REBIRTH. OK. Fine. I cracked open that massive tome first. Luckily, the bottom of the first page indicated where to proceed. Check out my review for that. 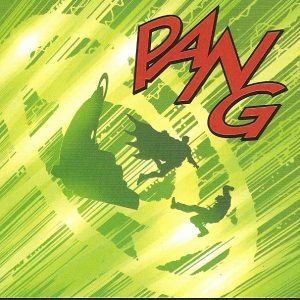 I went into extensive detail with Geoff Johns’ love song to the proper DCU. This is Mr. Johns’ send-off after an uninterrupted run. Bravo!!! Geoff has never cowered from long-term commitment. Being the superb scribe that he is, he encapsulates the major arch and properly closes it. 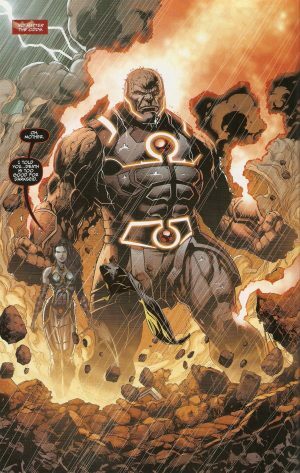 Darkseid at the inception of the League as well as at its temporary end is beyond obvious. 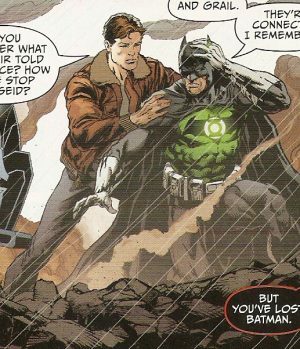 What really stood out of me was the camaraderie between Hal and Bruce. The two got off to a rocky start that was less than impressive. They haven’t interacted much in the last four years but it gives me warm fuzzies to see that the GL of Earth believes in the DK as well as admiration. Batman is the best of the best. Hal never question Bruce’s brilliance. He genuinely wants to be let in to the twisted macabre world by asking the identity of his greatest foe and failure. He tries to establish a link, one that surpasses wielding the universe’s most powerful weapon. The universe achieves its equilibrium. 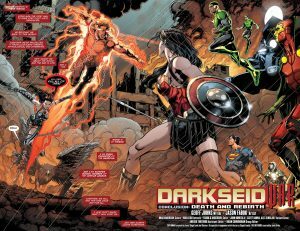 Three major deaths lead to two fresh starts: Baby Darkseid (CCRREEEEPPYY!) and the latest inductee to the GLC. 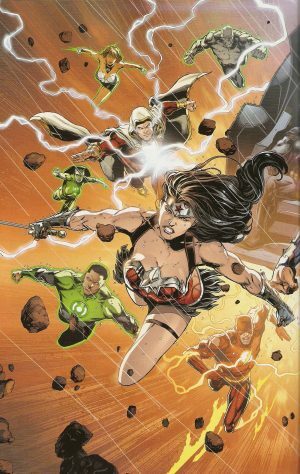 Jessica will be paired with Simon Baz for the GREEN LANTERNS (plural) title and remain on the League. Love is lost. Trust is broken. Scot must steer clear of his wife. Diana has to give new essence to her existence. She will most likely seek her unfamiliar brother while dealing with the repercussions in her solo title. 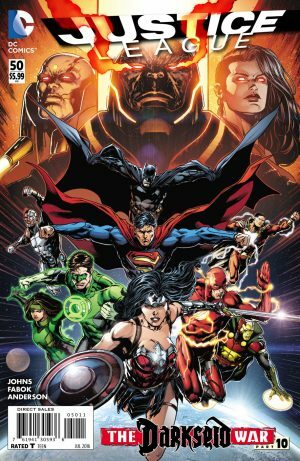 Jason Fabok maintained the highest degree of quality during his tenure with the World’s Greatest Heroes!! It’s anyone’s guess as to where he’s headed. I will miss his spectacular work immensely. From the most microscopic to the most bombastic, Mr. Fabok is the God of Art!! The six full pagers are reminiscent of a gallery while he does justice (pun intended!) with the two full-page spreads. Two things deserve special recognizition: the aerial view of Gotham City as Flash tries to run from the Black Racer; the (c)overt display of the three iterations of the Joker in the Batcave. Brad Anderson is an excellent choice to colour over Mr. Fabok’s pencils. Mr. Anderson was given the immense fortune of the bulk of REBIRTH (52 pages in all. Coincidence?!?) At any rate, it’s refreshing to see the emerald energy overpower the ashen skies over Gotham. 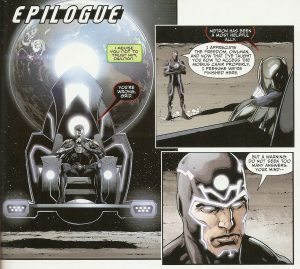 Also, the blue tinge encompassing the Earth as well as powering the Mobius Chair provides a serenity to the frenzied pace of the last nine issues. Rob Leigh must enjoy alphabet soup. He makes the letters jump right out especially during the biggest scenes. There are three major BOOMs, numerous PINGs and a never-before-seen sound effect: RMBBBLLL!!! Way to go, pro!! The nerdgasm I’m feeling is akin to Batman’s expulsion from the Chair. Reading and reviewing two ‘life-changing’ books in a 36-hour span is enough to make anyone’s head spin. I’m ready to repeat the experience in the near future!! The League returns to greatness in less than two months. The Magnificent Seven become the Octane Eight. All aboard for extreme adventure!! Geoff Johns ascends to the world of film at DC and its parent company Warner Bros. He will be sorely missed. I’ve purchased and read almost everything in his extensive library these past seventeen years. Onwards and upwards!! He hoodwinked us with the true ID of the Clown Prince of Crime but I can let that slide. Check out this jazzy John Romita Jr. variant! 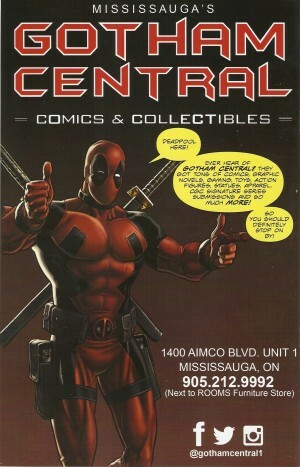 Thank you times infinity to my one-and-only local comic shop.